I wrote a book, this is it, it’s about my fieldwork in Belfast playgrounds in 1996-97, between cease-fires. I finished the manuscript just before the Good Friday Accords in 1999. The book (heavily revised, thanks to marvelous copy-editing via Rutgers University Press) came out in 2003. I am proud of this work. It is my attempt to write against the notion of the “two communities” in Northern Ireland as fundamentally different, culturally. My cross-community research in Belfast revealed a landscape where children (and their families) were engaged in the same practices, shared the same priorities, feared very similar things. 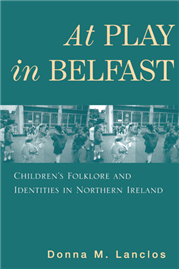 I used this book when I taught classes on children’s folklore, and also on cultural constructions of childhood. I understand it’s still being used in some anthropology, children’s studies, and folklore classes, and that pleases me tremendously. If you read this, I hope you will not only learn something about life, and in particular childhood, in late 20th-century Northern Ireland, but you might also understand a bit about where I continue to come from in my work now. I have never lost interest in the difference between what people think other people do, and what actually happens. I push back against narratives about “the future” when they come at the expense of people living in the here and now. I realize, now, that all of my fieldwork has been done in educational settings, and that none of my research questions are ultimately about education, but about the wider cultural contexts in which people in educational settings find themselves. I also hope you enjoy reading it. It’s still in print, in many libraries, and via your local bricks-and-mortar independent bookstore or the venue of your choice online. I had such a great time doing my fieldwork, even when it was hard, and worrying, and made me doubt a great deal about myself.